65th Square: GENS UNA SUMUS: Are We One Family? GENS UNA SUMUS: Are We One Family? Reflecting on the Olympiad tournament this past November and looking forward to 2010, there were many positive experiences to remember. Nations come from all corners of the earth to share their respective excitement of chess. In fact, prior to the Olympiad held in Dresden, Germany, pre-registration had broken attendance records. This was cause for celebration. I view the Olympiad tournament as an opportunity to market chess and present its universality to the world. New federations come to join the community of chess nations and to represent their flag and national honor. It has been this way since FIDE was founded in 1924 and adopted the Latin phrase "GENS UNA SUMUS" as its motto. This Latin phrase means "We are all one family" and has been the standard upon which all international sporting events are viewed. 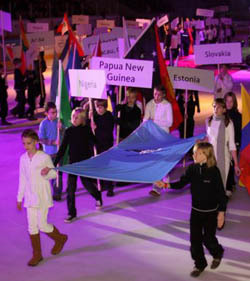 FIDE flag at Olympiad Opening Ceremony. Photo by Paul Truong. In my view, the Olympiad is not merely another tournament of determining the three best men's and women's teams. It should be a festive occasion celebrating the global reach and universality of chess. Today, the Olympiad typically involves more than 100 nations and more than 1000 participants. There is no tournament that can better represent the FIDE motto than the Olympiad. Chess nations, large and small, rich and poor, far and near, friends and foes, travel to a common venue to share the same stage. The FIDE General Assembly and Committees also meet during this period to chart the course for the future in chess and delegates are all focused on the singular goal of seeing chess succeed. However, the Dresden Olympiad brought out some elitist trends that need adjusting if chess is to gain the momentum necessary for growth. If this is not done, growth will continue to be uneven and sponsorship will continue to lag. 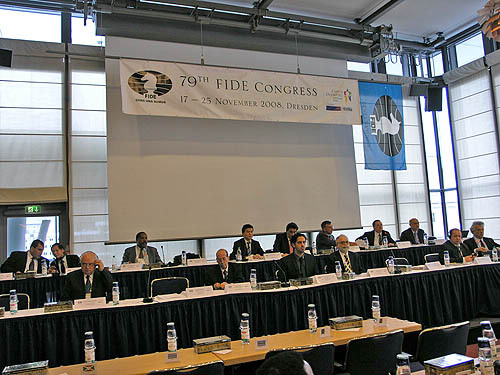 79th FIDE General Assembly in session. At the 2004 Olympiad in Spain, Germany bid for the 2008 Olympiad with great fanfare. The Mayor of Dresden travelled to Calvia for the presentation and was able to make a strong case for hosting the 2008 Olympiad. The mayor was made aware of many challenges. One such challenge was the issuance of visas. The mayor understood the challenge and reassured the traditionally affected federations in CACDEC that these issues were understood and would be managed. Months leading up to the Dresden Olympiad there were already signs of trouble as some federations were being denied visas for a variety of reasons. In discussing visa issues, there are so many reasons visa requests are issued and denied. There was a popular contention that those denied did not allow enough time for the application process. While that may have been a factor in some of the cases, a more common reason was "lack of financial ties" or "no employment." In other words, participation in the Olympiad was contingent upon whether you earned enough income. This certainly reeks of elitism and of course it carries other political implications such as security of borders. While the large majority of nations got their visas without a problem, several nations were either denied or required to furnish additional documentation to prove the legitimacy of their attendance at the Olympiad. In at least two cases (Uganda and Ethiopia), official FIDE correspondence was insufficient and embassies required an additional letter from the organizing committee. In some cases, they required an additional letter of assurance that players would return. This is of course aimed at the notion that Europe has had previous issues of individuals overstaying their visas. However, these possibilities are present for athletes in the quadrennial Olympics, but rarely is an athlete denied a visa to attend this event. It then becomes ironic that the Ugandans were initially denied despite traveling to Germany in 2005. 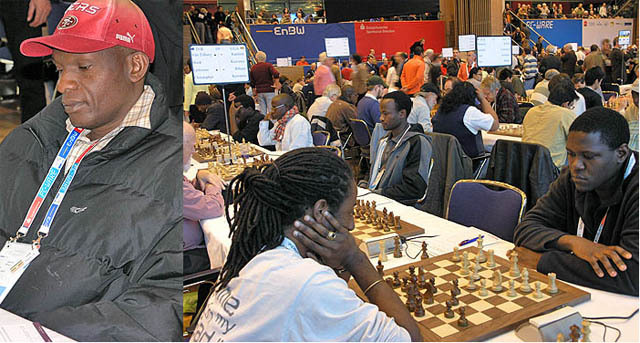 Uganda's Harold Wanyama wrote a beautiful piece on ChessBase about the 2005 trip. After being denied a visa for Dresden, Wanyama wrote an emotional plea on ChessBase about his OIympiad plight and that of teammate Shadrack Kantinti. Moses and Steven Kawuma, both based in England, were in Dresden playing the other two boards for Uganda. They pressed the issue with the organizers until the letter was sent several days later. While Wanyama decided that his chance to travel to Dresden had passed, Kantini decided to travel and played his first game in round #10! (Left) Shadrack Kantinti played his first game in Dresden in penultimate 10th round. FM Steven Kawuma and his brother Moses Kawuma (right) battle against the British Virgin Islands while the visa issues simmer. Steven plays Bill Hook while Moses plays Christopher Art. Hook later complained about his number of forfeit wins (four). Photo by Daaim Shabazz. In a similar case, John Hasford of Ghana was denied a visa despite applying in advance. He made repeated pleas and was finally approved and arrived in Dresden to play his first game in round #6. In the Ethiopian case, one male and the entire woman's team had initially been denied because they showed "insufficient financial ties." After lengthy discussions, the embassy reconsidered. However, the embassy stated that the FIDE letter (with the men and women rosters) was insufficient and they needed a letter from the organizers. The letter did arrive, but the women were denied visas because their names were somehow left off. The reason of "no financial ties" was also present in other cases including an arbiter from Botswana. In another case, three Rwandan players were given visas, but not for the duration of the tournament. They had to forfeit round #11. However, there were some fortunate cases. Egypt received all visas except for two denials of two recent graduates ("insufficient financial ties"). Through diplomacy and media pressure they gained reconsideration and approval. What can FIDE do that FIFA and the IOC already does as far as visas are concerned? Do embassies tell athletes they cannot compete in the Olympics because they don't have financial ties? Certainly not! What is often not understood by many is that applying for a visa in a developing country is a very tortuous political process and contingent on so matter issues. Getting a visa is contingent on getting the plane tickets which is contingent on getting sponsors which is contingent on the public relations of chess. In developing countries, finding a sponsor can be a daunting task and it may take months and even years to establish credible goodwill. Some of the sponsors may even pull out in the 11th hour after having committed months in advance. The global financial crisis affected the sponsorship of several nations and left them scrambling for solutions. There were a few rule changes employed in Dresden. One of the most controversial changes had to do with the forfeit rule. It created a lot of controversy and angst. Some of these cases involved players who were at the venue on time, but had stepped away from their boards. During the last round, the tram the Malawi team was riding broke down. They were staying nearly an hour from the venue and came to the venue 10 minutes late, but the forfeit was upheld. There were also accounts of players sprinting and dodging through a wave of people to make it their boards. Many detractors have made the claim that in other sports, teams cannot come late. However, in chess, a game can officially start with only one player. Should this rule be revisited? Perhaps it should, but not without careful planning. In addition to the forfeit rule, the arbitration of cases was inconsistent. In the Mongolia-Ukraine match, two Mongolian players were allowed to play by an arbiter after arriving minutes late. The Ukrainian captain complained, but did not lodge a formal protest. The only forfeit involving elite teams occurred during the Azerbaijan-France match when GM Vladislav Tkachiev was unable to show for the match. In the Palestine-Jamaica match, GM Evgeny Ermenkov walked away from the board to grab a pen. When he returned, he had forfeited, but was allowed to play by the arbiter. The Jamaicans appealed and the arbiter's decision overturned. Ermenkov and FM Warren Elliott had played 12 moves. In the Gabon-U.S. Virgin Islands case, Gabon's Jean-Pierre Moulain (who was on 8.5/10) arrived early and greeted his opponent, but stepped away for a bathroom break. When he returned, he had forfeited. The other two Gabonese players abandoned their games and were clearly distraught. Controversy erupts in the Gabon vs. U.S. Virgin Islands match as Jean-Pierre Moulain (tan suit) protests the decision by arbiter. Photo courtesy of Barthelemy Ndjila. President Kirsan Ilyumzhinov made statements at the FIDE General Assembly impressing upon the delegates that professionalism of chess was a priority. This was a direct result of FIDE's appeal for recognition in the Olympic Games, but at what cost? The question here is whether the Olympiad is the best tournament to introduce such a new rule. Olympiad tournaments have many logistical challenges. In Dresden, teams were spread in hotels throughout the city as far as an hour tram ride away. The more expensive hotels were next door to the playing site and those teams had no problems making the rounds. If players are relying on public trams in unfamiliar cities without any regard for logistical challenges, then the forfeit rule becomes unfair. In future Olympiad tournaments, there has to be consideration of the layout of the venue and other factors before imposing such a strict rule. If there is an Olympiad village where players come from an equal distance, then such a time rule can be reasonably applied. This issue will be revisited in the next President's Executive meeting. However, the lesson is a harsh one for many nations who were adversely affected. In terms of the board medal awards, the criterion in Dresden was based on total performance ratings (TPRs) as opposed to the traditional win percentage. In principle, this criterion seems to appeal to the elite players as a safeguard against huge scores that occasionally occur amongst the weaker competition. Since performance ratings are based in great part on a player's history, it will mean that those players not playing for an elite nation will have virtually no chance of winning an individual board medal despite their best possible performance. One may wonder, "Who cares about the players from smaller and weaker federations?" This is a painful, but ever-present question regardless of whether the context is antagonistic or one of genuine interest. Should we care about smaller federations? Should we care that the spirit of chess be spread widely to far-flung countries? Should we ensure that a variety of nations get exposure during this festival? Looking at the worldwide media coverage for the Olympiad, there was little evidence to suggest that teams from Africa, the Caribbean, the Middle East and Latin America were participating. We must revisit the question, "What is the purpose of the Olympiad?" If the focus remains on the strongest federations, it will eventually become an exclusive team event. However, the World Team Championship already serves this purpose. Hopefully, FIDE will reconsider using the statistic that is most commonly measured in chess… win percentage. This will at least provide a wider range of individuals a reasonable chance of winning a medal. This is a great incentive for attending and competing in the games. There are many reasons that a more inclusive method is appropriate for chess. For these smaller federations, a medal-winning performance can invigorate a nation's chess culture, inspire a new generation of chess players and demonstrate the universality of chess. The Olympiad often carries themes that present the event as a celebration. A board medal for a small federation would show that chess has been successful in its outreach. This can also give chess quite a boost in terms of visibility for the rising player and thus more opportunities and possible invitations. The chess community understands and appreciates the excellence of professional players. They have a long history of accolades and their success, to a great degree, this is expected. However, if an unknown player from Vanuatu, the Maldives, Comoros or Liberia happens to score 9/10 or 11/11, there should be a way of recognizing this feat on the largest stage in chess. We may have uncovered the next rising star. 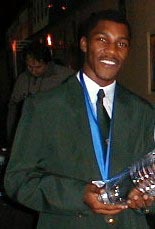 IM Robert Gwaze after his sparkling 9-0 performance at 2002 Bled Olympiad. Photo by Allan Herbert. When IM Robert Gwaze of Zimbabwe scored 9/9 (2690 performance) at the Bled Olympiad in 2002, it stood as one of the brightest moments of the tournament. In Dresden, he would not have received a mention. 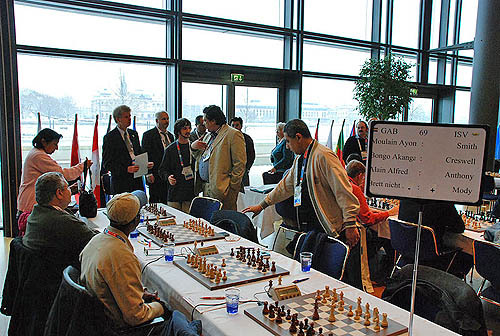 The success of smaller federations can help the global appeal for chess. This will also help all chess nations advance their own initiatives. In my view, this is what GENS UNA SUMUS is about.